They didn’t just give us Lyla, they gave us our lives back. Clare & Rob suffered the heartbreak of losing 5 babies. They had Lyla thanks to the care of the Tommy’s Manchester centre Rainbow Clinic. 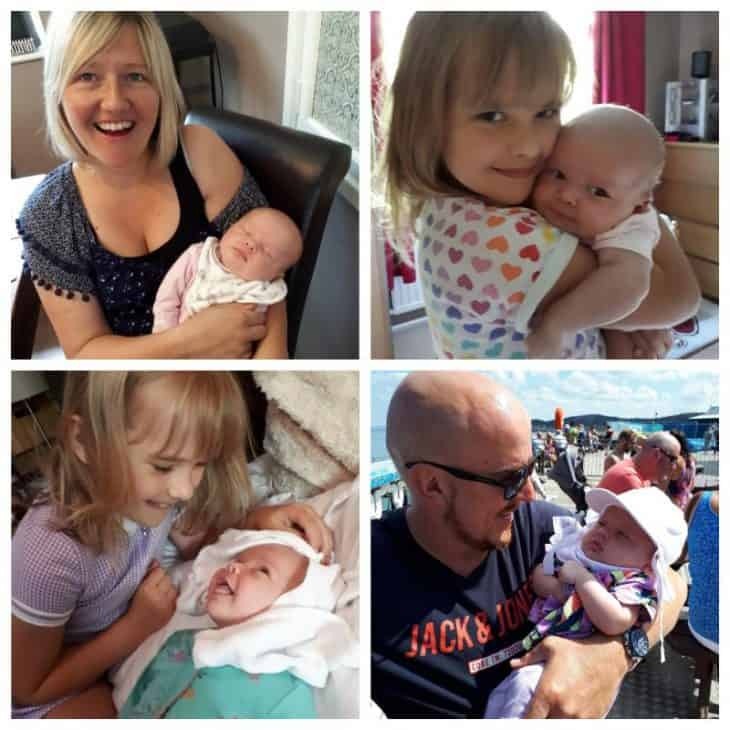 Clare, 40, and husband Rob, 41, from Manchester, lost a daughter in 2009 before going on to have their daughter Eva, now seven. They went on to suffer the heart-breaking loss of four babies. I fell pregnant on our honeymoon, we were shocked, a little scared, but overwhelmingly happy. Our 12 week scan was so exciting, getting to see that little blob for the first time. At our 20 week scan they said baby was measuring two weeks behind, but they reassured me so I didn’t really worry. Two days before our next scan I woke up and couldn’t remember the last time I’d felt movement. I felt something wasn’t quite right but I put it to the back of my mind. At the scan, as Rob sat next to me, holding my hand, I could tell straight away something was wrong. The sonographer said, ‘I can’t find a heartbeat’ and I put my hand over my eyes and said, ‘We’ve lost our baby’. When the second sonographer confirmed there was no heartbeat I just couldn’t believe it was happening. When the consultant said I’d take a tablet then come back to ‘start the procedure’, I didn’t understand. He explained I’d have to give birth. Holding that tablet, I kept thinking, ‘What if they’ve got it wrong?’, begging our baby, ‘Please give me a sign, just one kick,’ but, of course, there was nothing. At home I balled my eyes out. My only thought was, ‘I want to be pregnant again’. It took three days to deliver our daughter, it was like my body didn’t want to let go. When the midwife asked if I wanted to see her I started to cry, I didn’t want to look. Rob felt differently and encouraged me to see her together so they dressed her and brought her to us and I’m so glad we had that time together. I felt such love, but such guilt. I just kept kissing her head and saying, ‘I’m sorry’, I felt I’d failed her. We called her Emma. A post mortem showed she had been perfect which only made me feel worse. Four months later I was pregnant again and my care was consultant-led, no extra medication but more appointments. Still, I worried constantly, overwhelmed by the sense of responsibility, aware that only I could know if everything was okay. It felt like the pressure of the universe on my shoulders. Eva was born by c-section and her arrival seemed to reset everything. I felt like we could get on with our lives, that lightning wouldn’t strike twice. I couldn’t have been more wrong. We just couldn’t believe it was happening again. Our daughter was delivered at 25 weeks and we called her Faith. When we started trying again six months later we were determined it would be our last shot. People said we were brave but we weren’t, it’s just the desire to have a child overrides common sense. It overrides everything. At that point I hated to see pregnant people, scan pictures or babies. I felt like this was changing me as a person and it was horrible. I was scared and worried that this would affect our marriage and have a terrible effect on Eva too. I got pregnant and, again, at our 20 week scan the baby measured small. They kept me in overnight then sent me home. It wasn’t until 27 weeks when I stopped feeling movement. I was terrified but almost calm because I knew how it would play out, they give me a tablet, I go home, I come back for the worst experience imaginable and then I’m heartbroken. This time we had a little boy and we named him Bobby. After losing him we both felt we were done. Our consultant at Wythenshawe suggested we speak to his colleague at St Mary’s but, at that point, we just had nothing left. I focused on Eva and on getting healthy. Rob and I had many, ‘Shall we? Shan’t we?’ conversations but it wasn’t until early 2014 that we went to see Dr Alex Heazell, clinical director of the Tommy’s stillbirth centre at St Mary’s. He’d studied my history and found a similarity between the placentas which, he explained, looked like the blood vessels had become clogged with waste and inflamed due to an auto-immune response to my pregnancies. There was no cure but they could help and support us if we wanted to try again. It was a relief to have an answer, to know it hadn’t been my fault, and we decided to go for it. I fell pregnant and an early scan showed we were having twins but, just days before our 18 week scan, again that sense of doom, I just felt a bit less pregnant. At the ante natal clinic a midwife said she could hear a heartbeat but then, at the scan, I knew straight away. I think it was me who said, ‘There’s no heartbeat’, I was almost grieving before it was confirmed. I went through the same horrific ordeal again, giving birth to twin girls. We named them Isla and Georgie and losing them left me with absolutely no hope. We went round and round for a year before deciding to try again but we promised each other this would be the last time. I fell pregnant in August 2017 and saw Dr Alex at five and eight weeks and had scans in week 12, 17, 20 then every two weeks. They also gave me blood thinning injections, aspirin, steroids, an anti-inflammatory medication used in women with malaria plus extra vitamins. Dr Alex and his team really held my hand every step of the way, they were so lovely and really understood how we felt. Just the continuity of care, not having to explain the misery over and over, meant so much to us. Lyla arrived by c-section and when I saw her little face I burst into tears. There are no words to explain the relief, I felt like I could finally relax. Rob is now surrounded by girls and he loves it. I couldn’t have made it through so much loss and grief without his constant support and the experience has definitely made us stronger as a couple. Seeing him with our daughters brings me so much joy and makes me feel so grateful that we never gave up. That sense of despair and hopelessness becomes so overwhelming and the support and knowledge of the Rainbow Team at St Mary’s really restored our hope. They didn’t just give us Lyla, they gave us our lives back. We’d spent 10 years feeling such sadness, I don’t know where we would be without their help. I’ve got my smile back and I finally feel like myself again.